Catholic Archbishop of Kaduna Diocese, Most Rev. Matthew Mon’oso Ndagoso, has on Saturday appealed to the Federal Government to empower the Internally Displaced Persons (IDPs), to engage in petty businesses like frying bean cakes (akara), yams, making moi-moi pending their relocation back to their habitat. The Archbishop further advice the government of the day to rehabilitate vocational centres for IDPs to give them sense of belonging. He made the charge through the Coordinator Justice, Development and Peace Caritas of the Kaduna Archdiocese at the presentation of palliative materials to IDPs from Borno and Adamawa states at Kudenda in Kaduna by the Christian Students Fellowship, Nigeria College of Aviation Technology (NCAT), Zaria. Most Rev. Ndagoso challenged the military to put in more efforts in its fight against the Boko Haram sect, while urging top politicians to accept the fight against Boko Haram as a collective responsibility. The Archbishop emphasized that those harbouring and perpetuating the prevailance of Boko Haram should be exposed by Nigerians who know them as well as punish those that have betrayed their responsibility to stop the menace. “We must speak with one voice to say that enough is enough. Nigeria is not for a selected people. “We must see ourselves as one and be our brothers’ keeper,” Archbishop Ndagoso declared. He said that the church has done a lot for IDPs and has continuously prayed that those inflicting the pains should change and accept Christ, while he advised the NCAT donor students not to relent on their love for the needy. “You should make a difference where ever you find yourselves, especially when you go into the labour market,” the Archbishop advised. The NCAT Christian Students’ President, Seun Adeleke. 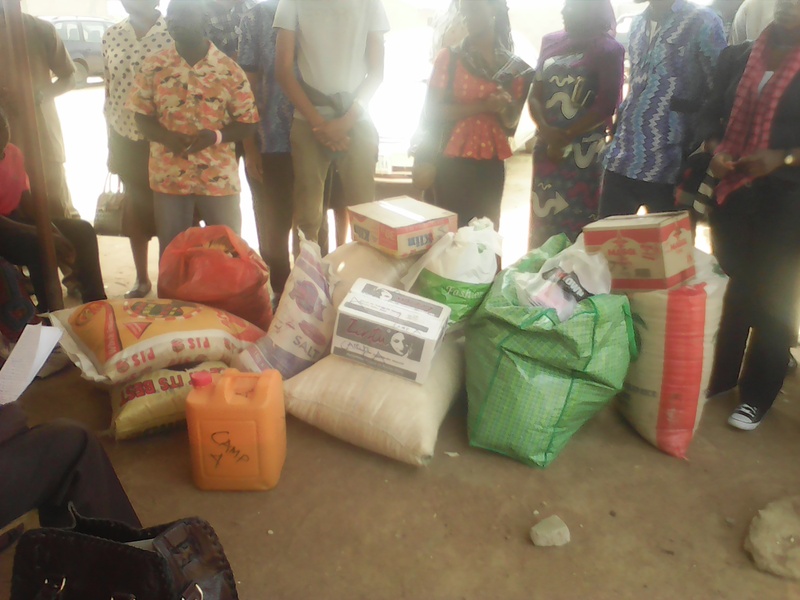 had earlier said that the gesture was part of the Fellowship’s yearly outreach to the needy to encourage them because it is in fulfillment of the love Jesus Christ possessed. Leader of the IDPs, Mrs. Liyato Yohannah thanked the NCAT students Fellowship for their magnanimity and prayed God to guide and blessed them.